Copenhagen Contemporary (CC) is delighted to present 'I Have Grown Taller from Standing with Trees' by the Swiss artist Claudia Comte. 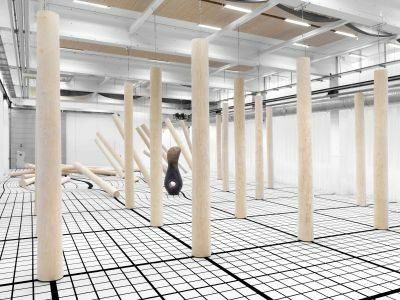 For her first exhibition in Denmark, Comte has created an immersive installation for CC’s largest hall. The presentation brings together sculpture, sound and 3D prototyping with the artist’s interest in archaeology, biodiversity and forestry. Inside the 1100 m2 large hall, rows of six-metre-tall debarked spruce trees are positioned along a grid of millimetric precision that directly corresponds to a digitally printed graphic carpet. A large ceramic sculpture sits at the centre of this seemingly peaceful forest, which is enveloped by filtered light, sound and the mild scent of resin released by the pale spruces. Moving through the exhibition, however, a collapse of order becomes apparent. The trunks have been struck by a powerful force and are suspended in a state of disorder. The geometrical grid of the carpet evokes the root system of the trees, which, via underground fungi networks, communicate with other trees along the forest floor. The grid – a structure which relays order and clarity – is also distorted, visualising the effects of this large-scale disturbance upon the forest ecosystem, above and below ground. Comte’s particular interest in the forest stems from her childhood spent in the Swiss countryside. In a period when many traditional methods are being replaced by automated technologies, the artist highlights the virtues of traditional craftsmanship by prompting a dynamic conversation between organic forms, new media and rendering software. The spruce trees of I Have Grown Taller from Standing with Trees may be viewed as time capsules in the way the trunks’ annual rings grow at different rates depending on climate conditions. This is worth bearing in mind when walking among the spruces, all approximately one hundred years old. As a totalising experience of light, scent and sound, I Have Grown Taller from Standing with Trees embraces the full force of nature. At the same time, it is nature’s cemetery of felled trees, mirroring the effects of our current era in which human activity directly impacts Earth’s biological systems. The installation reminds us that we are part of a greater whole where strong cooperative networks are as vital for trees as they are for humans. Visitors are invited to walk amongst the trees, climb the fallen trunks and take in the views of the collapsed forest. Evoking childhood memories of visiting the woods, visitors may carve their names or leave messages on the trunks. The artist also invites visitors to participate in a number of performances scheduled during the exhibition period. Comte was personally involved in the entire process of sourcing the trees, felling, cutting and sanding the trunks. Importantly, for every tree felled the artist has planted two new trees. The Swiss artist Claudia Comte is known for her site-specific installations that bring together handmade sculptures, graphic works, digital technologies and interactive installations that invite the audience to participate in activities such as arm-wrestling and dancing. Comte studied at the Ecole Cantonale d’Art de Lausanne (ECAL) and the Haute Ecole Pédagogique, Visual Arts. Recent exhibitions include: The Morphing Scallops, Gladstone Gallery, New York (2019), Electric Burst (Lines and Zigzags), Contemporary Art Museum, St Louis (2018), When Dinosaurs Ruled the Earth, König Galerie, Berlin (2018), Zigzags and Diagonals, MOCA Cleveland (2018), Swiss Performance Now, Kunsthalle Basel (2018), KölnSkulpture #9, Cologne (2017), La Ligne Claire, Basement Roma (2017), NOW I WON, Messeplatz, Art Basel (2017), Desert X, Palm Springs (2017) and 10 Rooms, 40 Walls, 1059 m2, Kunstmuseum Luzern (2017).